At a time when most Founding Fathers were leaving the national stage to focus on their home States, George Clinton left a lifetime of service in New York to become Vice-President of the United States. To this day, only one other person has served longer as Governor of ANY state as Clinton did during America's birth. George Clinton came from a moderately wealthy family in New York. After fighting valiantly in the French and Indian War, Clinton was appointed to the position of Clerk of the Ulster County Court of Common Pleas. This position began a long life in public service. George became a district attorney and was elected to the Provincial Assembly. He was in the Assembly when the Revolutionary War began. George Clinton was given the position of Brigadier General in the New York Militia early in the war. He was responsible for linking a chain across the Hudson River which prevented the British from sailing up stream. Clinton would attend the Continental Congress in 1776 and support independence, however, he left before the Declaration of Independence was signed. The following year, Clinton was given the position of Brigadier General in the Continental Army. However, he did not participate much on the field after that because he was elected the first Governor of the State of New York. Clinton would retain the position of Governor for the next eighteen years. 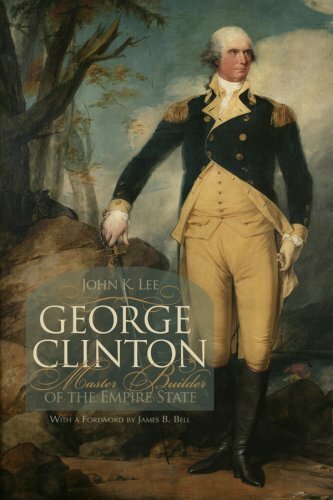 During his time as the leader of New York, Governor Clinton developed a close relationship with George Washington. He often used his power to help supply Washington’s Army. When the war came to a close, Clinton worked with Washington to negotiate the British evacuation of New York City. When Washington became president, Clinton (who was still Governor), accompanied him in the parade to his inauguration and through the celebratory dinner. Although Clinton supported the idea of a national government, he was a strong Anti-Federalist. He believed the new Constitution assumed too much power from the States, most notably the collection of tariffs. George was almost able to prevent New York from joining the Union, but once the Constitution had been ratified by nine States and became law the writing was on the wall. Despite his work against the federal government, George Clinton would receive votes for Vice-President of the United States in the first six elections the nation ever had. After serving another four years as Governor of New York, George Clinton became the fourth Vice-President of the United States when he ran with Thomas Jefferson for his second term. He would maintain that position when James Madison became president. This makes him one of only two people who have served as Vice-President for two different Administrations. George Clinton helped found America both on the battlefield and in the convention hall. In his 20+ years as Governor of New York, he affected the growth of both his home State and the Nation. He is also one of the select few who can say they were Vice-President of the United States of America. For more on George Clinton, pick up a copy of 'Master Founder of the Empire State' through the link below. Amazon is an affiliate of ours but the purchase is at no additional cost to you. Don't forget to subscribe to our email list for a new Founder every day!